Learning in Fun Environments (L.I.F.E) is all about providing a safe and fun area for your child to learn. 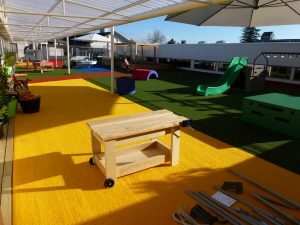 Created specially by TigerTurf for pre-schoolers, TigerPlay synthetic turf provides a safe and stimulating environment for children to grow socially, emotionally and physically. Soft, durable and inviting, our surfaces are free-draining so children can play on in any weather, and come in a variety of fun colours to stimulate the brain and encourage imagination. Useable all year-round, TigerPlay turfs require virtually no maintenance. Passing the ‘Critical Fall Height’ test, TigerTurf Play and Envy 35 surfaces are installed with layers of rubber pad cushioning, enabling children to explore without risk to themselves. They continue to undergo regular independent testing, verifying that TigerTurf products continue to exceed Government safety standards.